Expect Labs’ Anticipatory Computing Engine has the incredible potential to learn what we’re looking for even before we search for it, and several major industry players, including Samsung Venture Investment Corporation (SVIC), Intel Capital and Telefónica Digital, believe in it enough to invest in the project. The Anticipatory Computing Engine (ACE) is designed to use natural language processing to intelligently track a conversation and call up relevant information for the user. For instance, if the engine was powering a VoIP app that you were using, it could listen in the background and pull up restaurant hours and directions if you mention a place to your friend. The firm plans to use the latest round of money to scale up its technical team and build out its infrastructure. Some of the funds will go toward putting systems in place to handle the large data sets required to refine this type of technology. Expect Labs announced funding from Google Ventures, Greylock Partners, Bessemer, IDG Ventures, KPG Ventures, Quest Venture Partners, Naval Ravikant, Gil Elbaz and Don Hutchison last fall shortly after emerging from stealth mode. Last December, the startup signed a new partnership with Nuance to use its voice technology to power the MindMeld app that showcases the prediction engine technology. With Google, Samsung, Intel and Telefónica on board as investors, Expect Labs has a close relationship with some of the most influential corporations for putting this technology into consumer’s hands. After all, Google makes the leading mobile operating system, Samsung is the top mobile device manufacturer, Intel is the dominant chipmaker and Telefónica is the world’s fourth-largest telecommunications company. Dave Flanagan, Intel Capital: We are entering an era where the computing devices in our lives will not only be able to understand what we say, but they will also do a much better job anticipating the information we may need. We look forward to working with Expect Labs to explore ways to achieve this vision. Brannon Lacey, Principal, SVIC: Expect Labs has taken a unique approach to modeling context using sensor signals, such as GPS and audio, that are available in the new generation of computing devices. We think this approach is an important step toward creating a new layer of application and device intelligence. Tracy Isacke, Head of Telefónica Digital Ventures: Expect Labs is at the cutting edge of the future of search, developing solutions that will change the way we discover and share information. We see huge potential for its technology across all areas of our business, and this investment opens the door to close collaboration between our technical teams. In an interview with The Next Web, Expect Labs founder Tim Tuttle explained some of the potential synergies the company could have with its new investors. Samsung, for instance, has the system in place to power a broad range of devices, from home appliances and entertainment to PCs, smartphones and tablets. Embedded devices will call for alternative input methods, and Expect Labs’ ACE technology could help power that. Meanwhile, Intel is a natural fit because it could add an anticipatory engine to its chips and offer it as part of its Perceptual Computing initiative, which supports new human-computer interactions such as voice recognition and gesture. “What’s happening in the industry is every major company in the computer technology space is trying to develop expertise in all the layers of the vertical stack. Intel is trying to work their way up the vertical stack,” Tuttle said. In Tuttle’s view, Telefónica makes sense as an investor because it isn’t interested in being relegated to just a “dump pipe.” Anticipatory computing could be integrated on the operator side to add value to voice calls. MindMeld is currently in private release with some of Expect Labs’ partners. The company hopes to release the iPad app to the public later this year. An Android version is in early development and could be shared with partners as early as this summer. Tuttle noted that anticipatory computing software, such as Google Now, is just beginning to arrive on consumer devices. 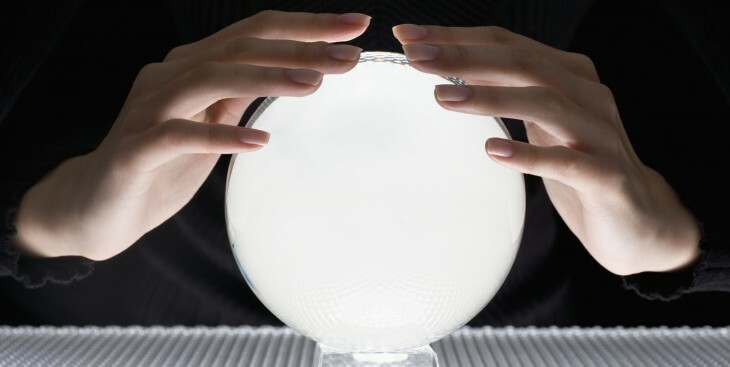 He predicts that a new wave of predictive products will arrive in the next year or two and the functionality could become commonplace within five years time. While many of Expect Labs’ investors already have great working relationships with each other, things could get messy down the road if its partners step into competition with each other. Tuttle said it hadn’t been a problem to date. “The reason we’ve taken this approach is because we’re trying to solve a very big technology problem. The only way we can be successful is if we have the support of the major players that care about it,” he said, adding that the startup is working directly with the people that know how to deploy its technology. Envisioning a future led by anticipatory computing brings up its share of privacy concerns, but Tuttle argued that background listening not actually very different from existing services. “Any time you send a text message and email, it goes across networks where the operator reads the message to see what you’re talking about, sometimes to sell you ads,” he said. Tuttle also reassured that the company will be “very respectful” of the privacy concerns that users raise, and they will always be able to shut off the ACE’s information sharing capabilities. He also pointed out that the technology’s functionality could be employed without having to send data to the cloud. I’m glad to see Expect Labs picking up another batch of powerful investors to help it bring its product to market. I’m eager to start using this technology, though I’m crossing my fingers that law enforcement doesn’t go all Minority Report on us and start predicting our crimes.